Daily Illuminator: In Soviet Russia, Role Plays You! December 7, 2009: In Soviet Russia, Role Plays You! A-heh, heh-heh? No? Okay, confession time. 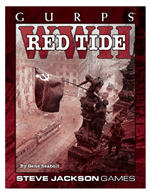 As I sat down to write this little piece about GURPS WWII: Red Tide, something occurred to me. I don't actually know that much about the USSR. I know they have awesome hats, lots of bears, and an unnatural affinity for the color red. Other than that, I seem to have this gigantic Soviet-shaped hole in my brain. And so it was that I made a lame Yakov Smirnoff joke. But hey, I can still turn this around! See, Red Tide is wall-to-wall facts about Soviet Russia. (Or page-to-page, I guess. Whatever.) If you, like me, couldn't write a joke about the USSR to save your career from the deadly precipice it now teeters on, then this book is the perfect place to start mining for comedy gold! Here, I'll just open up a page and show you. Okay, here we go. "Some 665,000 troops either died or joined the millions of Soviet captives that the Germans were starving to death." Oh. Uh. Hm. Nevermind. Uh. Enjoy the book! It's very informative!